Mickey Keating’s DARLING was one of the most distinctive horror films at this year’s Fantastic Fest, which is saying something. 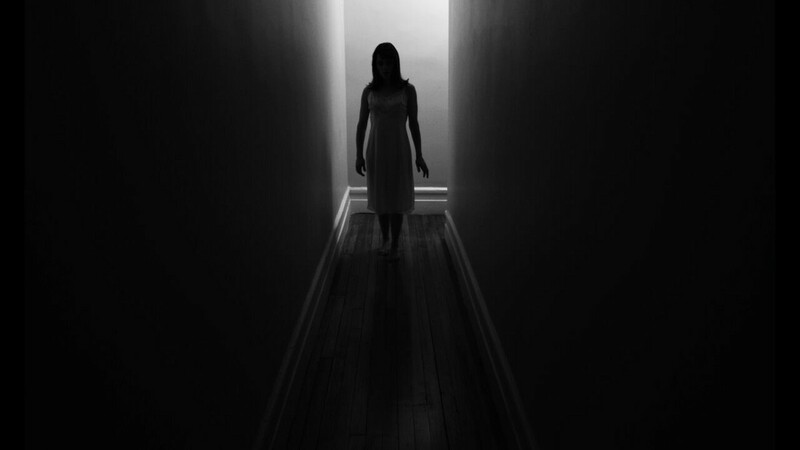 Shot in beautiful black & white and featuring a terrifying lead performance by Lauren Ashley Carter, DARLING is a convergence of 1970s slow-burn psychological horror and visceral shock. Seeing it in a large auditorium on a big screen with a very loud sound system made DARLING a full-on assault on the senses. Hopefully more audiences will get to experience DARLING this way when it finds its way to a wider release after being picked up by Screen Media Films. Daily Grindhouse’s Jason Coffman spoke to director Mickey Keating and actors Lauren Ashley Carter and Brian Morvant about the film. DG: How did you come to work with this group of collaborators, Mickey and Larry Fessenden, etc.? Lauren Ashley Carter (LAC): My good friend Lauren Conoscenti, an Executive Producer on POD,was responsible for introducing Mickey to Brian Morvant and myself. She is also a friend of Illium Pictures which co-produced POD. I met Larry during JUG FACE when he played my father. Then he was in POD with me as well. I believe that Mickey had interned with Glass Eye Pix at one point, so that’s why Mickey had called him about POD. 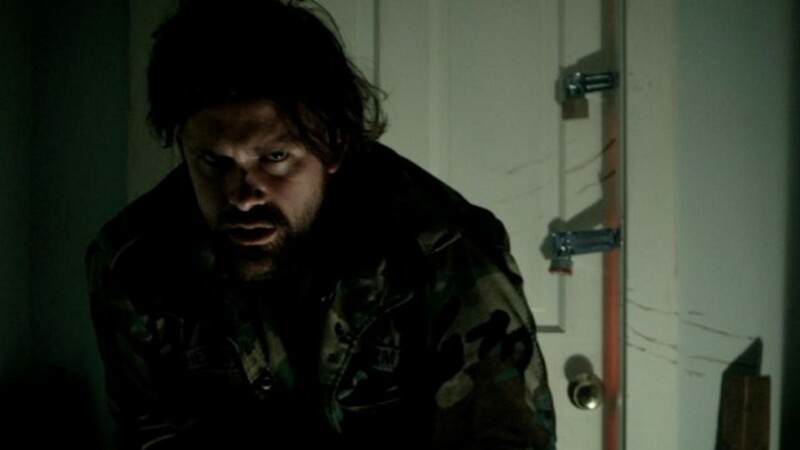 Obviously, Larry is a hero within the horror community, so it’s no surprise that Joe Begos wanted to cast him in THE MIND’S EYE as well. Larry was interested in DARLING because Mickey and I were working on it, so Glass Eye Pix came in to produce with us. Brian Morvant (BM): I actually met Mickey through the NYC based production company that co-produced POD, Illium Pictures. We had done a lot of work together over the years and became great friends, and so when Mickey was talking about shooting POD on the East Coast they were kind enough to pass my name along to him for the role of Martin. He and I talked over the phone briefly and I just loved his passion and enthusiasm, and was really into the character of Martin — I just felt for Martin immediately. So I geeked out and shot a quick scene from the film in my kitchen (ironically, the kitchen scene), sent it over to Mickey who liked it, and then he brought me on for the film. That’s where I met I met Lauren (who is awesome, obviously — she constantly impresses me as an actress) — then we all did DARLING together — then Mickey showed Joe Begos a rough cut of POD and that’s how I came on board for THE MIND’S EYE. Brian Morvant and Mickey Keating at the world premiere of DARLING at Fantastic Fest. Photo by Gary Miller. DG: I know you’ve said that the house where you shot DARLING was sort of a last-minute addition to the production. Did it have a big impact on how the story was translated from the page? Mickey Keating (MK): I think “last-minute” is a relative term when it comes to film production. Originally the idea was just to shoot a regular Manhattan apartment, similar to the one from MS. 45 or — if we were lucky — ROSEMARY’S BABY. Just a regular sort of setting for an extraordinary circumstance. I began writing the script in July, and around August, I found out that the house we ultimately shot in was an option. We filmed in November, so there was plenty of time to build the world and steer the story once we knew the exact location we were shooting in. DG: How long was the shoot for DARLING? The house is really perfect for the film, do you know if it has any kind of unusual history? I’m basically asking if it’s actually haunted, I guess. LAC: DARLING was about 12 days, I want to say? It’s such an amazing house. There are books about the old harlem houses, and this one was featured in one of them. It was actually turned into a boarding house for a while, most likely illegally. There was a Master and a Madam and they had separate quarters. There are also two kitchens. The main kitchen and then a small second one on the fourth floor. It was exhausting going up and down those stairs! If you forgot anything on the fourth floor when we were shooting on the first, you cursed at yourself the entire way up. The house was not haunted when we made the film, but I’m sure it is now! DG: When you approached the character of Darling, did you have a thorough backstory for her in mind? What was the process of creating that character? LAC: Mickey and I communicated daily for months before filming, so by the time we were in the house, we knew exactly who she was and where she was going. There are moments when I wondered, “Oh, God- have we gone too far?” But Mickey always assured me that we were on the exact path that we intended to be. Lauren Ashley Carter in DARLING. Still courtesy of Glass Eye Pix. MK: Lauren and I talked about it for a long time so by the time we showed up to shoot, she WAS Darling. I think when we first started discussing it was just in the form of “Okay, you were the victim in the last one (POD), so let’s make you the villain in this.” I sent her a lot of movies — AUDITION, TROUBLE EVERY DAY, THE SEVENTH CONTINENT, THAT COLD DAY IN THE PARK, THE TENANT — and would send her scenes and ideas as I was writing. It was a wonderful process because I basically just built characters for my friends and there was ultimately that level of trust and freedom to let the character really grow. That’s very exciting to me as a director. DG: What was the process for creating the character of Henry? BM: I think it took all three of us — Mickey, Lauren, and I — to really crack the fine line of what Henry does in DARLING. Because it’s a lot more subtle than Martin (in POD), and Henry is really there to trigger Darling’s next step in her journey. Since Mickey really wanted to shoot the scene where Henry and Darling go home together after meeting at a bar all in one continuous take, it was less about figuring it out before hand and more something we had to subtly tweak on the shoot day. We had to treat it like a play because we wouldn’t have the comfort of shaping the story with an edit later on. The camera sat in one locked off position for the entire four minute take. We’d do a take, see how we felt, ask a lot of questions then try to refine it more each time. And even though I certainly couldn’t picture how a one shot four minute take would play in the middle of the movie, I’ve worked with Mickey and Lauren before and love them both so I could trust that whatever it turned into it would surprise me. DG: DARLING is a really intense viewing experience, and a lot of that is thanks to your performance. What is your approach to performing such emotionally — and probably physically — exhausting material? LAC: In some ways I concentrate on technical aspects, like my blocking. I review my actions and want to know my marks and once I have that down, I don’t have to worry about where my body is and I can fill that specific space. I find freedom within specificity. Then I can just lose my self… and my mind. DG: How did the design of Darling’s costumes come about? Was that part of the process of creating the character or did that come later? Her costumes add a lot to the timeless feel of the film, along with the black & white cinematography and lack of overt signifiers as to when the film is taking place. MK: I knew that I really wanted Darling to look like the idea of the characters in all of those old-school haunt movies that I adore. Whether it be something like Deborah Kerr in THE INNOCENTS, Julie Harris in THE HAUNTING, or Gayle Hunnicutt in THE LEGEND OF HELL HOUSE, I figured it would be cool to present Darling as a character from one of those kinds of films, and then turn everything completely on its head when it’s revealed how dangerous she actually is. We spent a long time finding the right style of dress. I think I liked that one the best because — while it fit all those vibes I mentioned — it also was the closest to Anna Karina’s in ALPHAVILLE. DG: This is the second film to be released this year you two made with Mickey. Were the two shoots wildly different, or did you two sort of establish a way of working on POD that carried over to DARLING? LAC: They were completely different. POD was a significantly larger crew with Ilium Pictures co-producing. DARLING was bare bones. We had less than half of the crew that we had for POD. For DARLING, I actually slept in a room in the house every night with the camera and gear while the crew stayed in a little room together away from the location. The house and I became very close. In POD, I was surrounded by people all of the time. We all lived together, and all of my scenes were with Brian and Dean. DARLING was very isolating, but I think it was a huge service to me for the role. BM: Even though POD and DARLING are two totally different films with drastically different style and energy and pace, it was the same atmosphere working on both, and very much the same working on THE MIND’S EYE, too. Mickey loves to talk about the script and the character. He always has a few films that have influenced that specific project or character. On POD we talked a lot about TAXI DRIVER, and Travis Bickle’s mental state. We talked about JACOB’S LADDER and BUG. We came up with the idea of Martin shaving his head together. Obviously it’s a reference to TAXI DRIVER, along with the military jacket. And there are a lot of Travis Bickle parallels in that this is a guy who is such a hero in his own head but so disconnected and alienated from the world around him, and that isolation pushes him to some pretty extreme actions. Meanwhile, Mickey’s doing the same thing, having similar conversation, with all of his other collaborators. DG: It seems like Mickey is building a solid crew of regular collaborators on both sides of the camera. BM: It’s no small coincidence that this group collaborates together so much. Both Mickey and Joe (Begos, director of THE MIND’S EYE) are such huge film enthusiasts. They love the horror genre, but they also just love film, and experimenting with style, and paying homage to some of the films they geeked out over growing up. Mickey’s worked over and over again with Mac Fisken his DP, with Giona Ostinelli and Shawn Duffy his composer and sound designer, Valerie Krulfeifer his editor. That’s Mickey enthusiastically building a team that he trusts and enjoys being around and can take risks with because Mickey really enjoys making films and wants to challenge himself and make something uniquely different each time. I think that creates an atmosphere where everyone can fearlessly bring out the ideas they are most excited about. Because in the end he does completely collaborate with each member of the team and shapes the final film with them. DG: Lauren, you’ve had a string of great roles in really interesting independent horror features since THE WOMAN back in 2011. What draws you to genre films? LAC: I, myself, am a fan of genre films. There is a lot of freedom to create layered and complex characters within the genre. It’s definitely the most fun to work on. I want to make movies that I would want to watch as a fan. DG: What are some of your favorite classic and modern genre films? Are there any performances from those films or others that you feel have been a particular influence on your approach to acting? LAC: This is a constantly evolving list for me. I grew up watching a lot of campy horror films with my father, like the SLEEPAWAY CAMP trilogy, FRANKENHOOKER, BASKET CASE. HELLRAISER was the first horror film I ever saw, so it will always be a favorite. My grandmother let me watch older thrillers that I loved equally: WHATEVER HAPPENED TO BABY JANE? (she was adamant that I get over my Marilyn Monroe obsession and made me watch Bette Davis, Carole Lombard, Claudette Colbert, and Jennifer Jones films). Joan Fontaine gives one of my favorite performances in SUSPICION. Ruth Gordon was such a delight to watch in ROSEMARY’S BABY after I had first seen her in HAROLD AND MAUDE. And Ellen Burstyn is a hero of mine from ALICE DOESN’T LIVE HERE ANYMORE, THE EXORCIST, REQUIEM FOR A DREAM. These women impacted me greatly as an actress. They have such tremendous focus and vulnerability in their work. I hope that, in my own work, I can achieve even a fraction of what they have. More modern films that I love in the genre: TAXIDERMIA, THE BABADOOK, A GIRL WALKS HOME ALONE AT NIGHT, SYMPATHY FOR MR. VENGEANCE, OLDBOY, MAY, MARTYRS. There’s a really long list. I can’t wait to see THE WITCH and GREEN ROOM. I’ve been so excited hearing all of these great reviews for the films playing at festivals right now. DG: What kind of equipment did you use to shoot DARLING? Were there any particular cameras or lenses that you wanted to use to get specific looks and textures? MK: We used the RED but framed for old-school 1.66:1 in camera — there was never going to be a world where it wasn’t going to have that aspect ratio — which is fairly uncommon now. We shot on very wide lenses and didn’t get much coverage because it didn’t feel necessary for this kind of story. The script was a mixture of dialogue and storyboards that I made well in advance. We also avoided handheld as much as possible, except for the exterior city scenes, which I wanted to look like Godard’s ALPHAVILLE or VIVRE SA VIE or something closer to that. 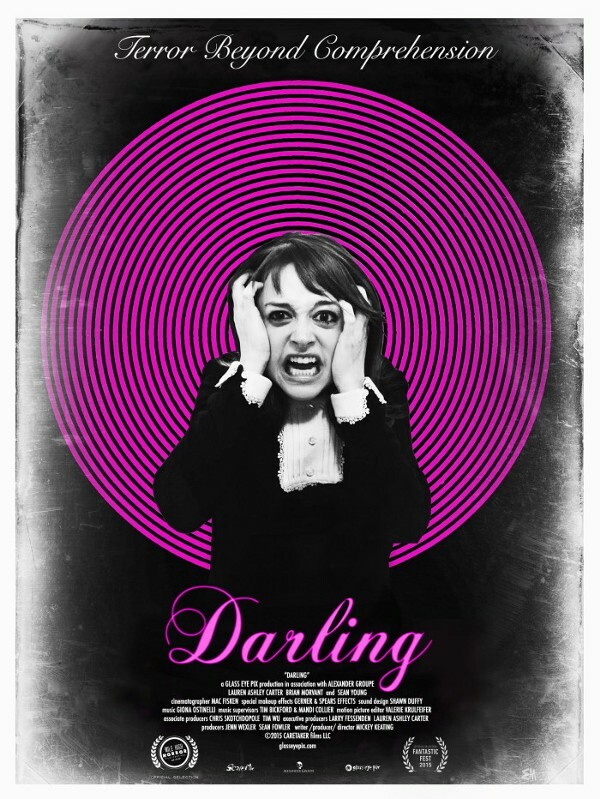 DARLING poster. From Glass Eye Pix. DG: Obviously Polanski’s “Apartment Trilogy” was a big influence on DARLING, but the near-subliminal cuts and sound design feel more like they’re taken from experimental film. Are there any other influences — narrative film or otherwise — that you used to refer to when designing DARLING? MK: The nightmare sequence from THE EXORCIST was a huge influence over our editing and the entire soundscape wouldn’t exist without David Lynch. Val (my editor) and I watched ERASERHEAD a lot when we began to cut. We also watched a great deal of Hollis Frampton’s work because his editing and sound can be so abrasive that it really throws you for a loop. I think this film also owes a lot to IMAGES and THAT COLD DAY IN THE PARK by Robert Altman, LES DIABOLIQUE, MS. 45, Sam Fuller’s SHOCK CORRIDOR, and certainly to Gaspar Noe and Jean Luc Godard. I wanted DARLING to be an unholy combination of 70’s style experimentalism, 60’s dread, and French New Wave. DG: It seems like the sort of female-centric 70s-style psychological thriller/horror like IMAGES and THAT COLD DAY IN THE PARK is making something of a comeback lately. Any thoughts on why that might be happening now? MK: I can’t say for sure why, but I’m glad it’s happening. From my perspective, it really comes down to the actor and what story I want to tell with them. With Lauren, I just wanted to create a vehicle for her to go full-force with something she’d never really done before so we made it happen that way. There is no world where Darling would have been played by a guy — or even another girl. If there’s an actor that I like, I’ll find a way to tell a story with them. DG: Do you have any upcoming projects you would like to discuss? LAC: I am working with Illium Pictures and director Natasha Kermani on a sci-fi drama feature called IMITATION GIRL. You can check it out on www.imitationgirlfilm.com We shot the first half in New Mexico and are gearing up for the second half in New York. Also, check out THE MIND’S EYEby Joe Begos when it comes out. It’s a really fun horror film with a ton of exploding heads and an incredible sound track. Lastly, I created and co-wrote a web series with my friend and comedian Lewis Black called THE MENTORS. We will be posting that on his website soon. It’s a dark comedy about mentorships in the entertainment business. And I have a lot more projects in development, so just keep checking in on Twitter @LAC_voyager and my Facebook actor page:Lauren Ashley Carter. MK: We’re just about wrapping up the edit on my new film CARNAGE PARK, which is, again, completely different from all of my other work. There are still a few wacky experimental sequences, but this one’s more in tune with American crime and horror films of the ’70s — Sam Peckinpah’s THE GETAWAY, BADLANDS, Peter Watkins’ PUNISHMENT PARK, THE HILLS HAVE EYES, and THE TEXAS CHAIN SAW MASSACRE. It’s an ensemble piece starring Ashley Bell, Pat Healy, Alan Ruck, James Hebert, Larry Fessenden, and quite a few more. After that, we’ll see where the cards fall! Huge thanks to Lauren Ashley Carter, Mickey Keating, and Brian Morvant for taking time to talk to us, and equally huge thanks to Kaila Hier for making it possible. DARLING has been acquired for distribution by Screen Media Films, stay tuned to the official DARLING Facebook page for more information on future screenings. Next [NEWSFLASH] WHO IS THE THING (AGAIN)?